Forgive me if I missed a discussion of this topic in the forum - I looked but couldn't find one. Can dbpoweramp for the Mac convert DSD to Flac? If so, can the DSD file be converted into various bit rates (16 & 24)? 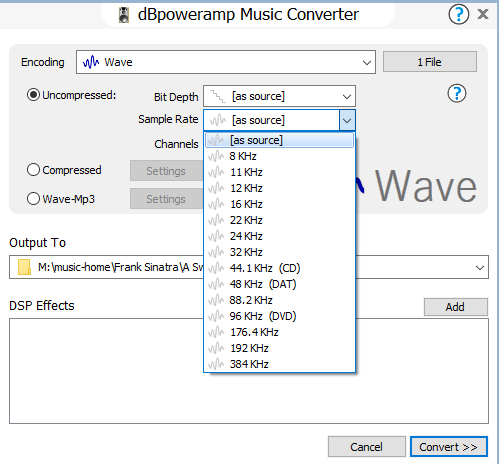 dBpoweramp turns DSD into 96KHz 24-bit PCM, which can then be written to any file format, WAV, FLAC or another. If you wish to convert to a different sample rate / bit depth, you can insert DSPs to do so (preferred: sample rate first, bit depth later). Does the user have to choose any settings to ensure that, when Music Converter converts from DSD to FLAC, it filters out bad frequencies? Or is it automatic? Is it necessary to use the low-pass filter to avoid damaging speakers from the frequencies? Thanks. Thank you. What advantage does the low-pass filter provide? The sample frequencies have nothing to do with the audible, actual sound frequency (save spurious artifacts). Yes and no. The highest / max. sound frequency depends on the sample frequency (Nyquest / Shannon). True enough. You can't sample anything higher than the sample frequency. But seeing as human hearing top end is around 20kHz it's not likely to be an issue. Good question. Looking at the help section, it appears DSD can include harmful frequencies (see above if DSD sf is really high). Harmful to what/who remains a question. Dogs perhaps? These files started, I think, as 5.4-MHz DSF and were converted to 44/16 FLAC files. Should I now run them through the low-pass filter, or did the conversion to 44 KHz already eliminate the harmful frequencies? I think I have seen people mention as a general suggestion the filtering out of anything above 30 KHz. A 44-16 file is the same as what is on a CD. 44 (presumably actually 44.1) thousand samples per second, 16 bits of resolution. Assuming that your digital to analog converter is working properly (and it works the same for these converted files as it does for a ripped CD) there is nothing of significance above 22.05 kHz that will be reproduced, per the above mentioned Nyquist/Shannon theorem. In practice, as the low pass filter already in your digital to analog converter has some "slope", the upper reproduced frequency slopes off, provably starting about 20 kHz. So if playing CDs doesn't damage your tweeters, then playing the converted files won't. This does raise the question, if you spent more for the DSD sources, why did you spend the extra money if you are converting them to CD quality files? For all practical purposes you are ending up listening to a file that is the same as the material on the CD. If you want to get any possible benefit from the DSD files, you would convert them to 96/24 lossless (PCM/FLAC or whatever) or better files. I included the word possible because it is very questionable whether you could actually hear any difference between 96/24 and 44/16 lossless files from the same source in a properly conducted A/B/X test. I do understand that some material re-released in DSD has been "remixed" or "remastered", whatever that may or may not mean. If the actual audio has been manipulated in some manner, that is really an artistic matter, for better or worse. And you, as the consumer must determine whether it is better, the same, or worse. Good question. I bought the files of the masters that I wanted in the only format offered, DSF, and I would like to play them from my iPhone in the car and on my headphones, but moving the DSF files to the iPhone through the program Waltr2 seems to preserve their native size. And they take up too much space on my iPhone. I leave them in DSF for my home streamer. I doubt that I can hear any frequencies above 20 KHz, but I leave them in their native DSF format at home. it is very questionable whether you could actually hear any difference between 96/24 and 44/16 lossless files from the same source in a properly conducted A/B/X test. Actually, I agree with the 44.1/96/192 not being significant. But I don't agree with 16/24. The latter is to my ears an audible difference and an improvement. I have done comparisons between 44.1/16 and 44.1/24, as well as 96/24, and the difference betwenn the two 44.1 was much clearer than the 44.1 v 96. With source DSD64 and target fs at 44.1kHz or 48kHz there is no need for a seperate lowpass filter as the signal is steep lowpassed at fs/2 in the SRC process. For target fs 88.2kHz and above a steep lowpass filter starting at 30kHz in front of SRC is advisable. I did a little research and found above 26kHz you can't distinguish the music signal from the noise shaped noise, so I lowpassing at 26kHz with a steep filter min. 48dB/octave. If you don't want to burn a CD I would stay at 24bit. I'm usually doing DSD64 to PCM 24bit-88.2kHz. Don't forget to dither to the final wordlength (16bit or 24bit) as final step. Last edited by Kempy; 01-02-2019 at 01:15 AM. 1. What is the reason DBPA defaults to 24/96 vs. 24/88.2? In other words, is this a design decision, based on the design/performance unique to DBPA DSD codec conversion and filter process, that Illustrate recommends 24/96 and hence it's the default? 2. If the end user selects 88.2 from the drop down above, is the conversion done (a) 'directly and immediately' to 24/88.2, or (b) does the conversion actually happen to 24/96 first then DBPA 'secretly' executes the SRC DSP function (even though it isn't explicitly selected) to downsample to 88.2? 3. Does Illustrate have an eye to revisit the DSD codec in terms of filter performance, or is the sound today 'best can ever be' and the only updates to the DSD codec would be to support higher and higher DSD rates? I ask this because we know over the years Illustrate made great strides in regular SRC evolution, and was likewise curious if a similar approach is active/planned for DSD conversion. Very much appreciate guidance on the above.